Hello and welcome to JT Hughes Honda in Shrewsbury. 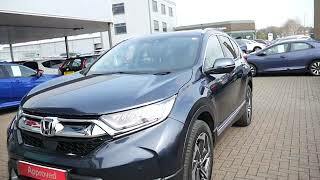 Today I'm going to show you around our new demonstrator, the Honda CRV. And this is the EX, finished off in the Cosmic Blue metallic paint, and is the 1.5 twin turbo engine, with a manual gearbox. Now on the EX, you do get your rear parking sensors, dual exhaust and your rear parking camera, as well as your hands-free power tailgate. Now, as you'd expect from the CRV, it's got an ample boot space with the spare wheel. And you do also get your 12-volts in the back. Then just a button to close it as well. On the EX, you do also get your privacy glass in the rear, 18-inch alloy wheels, full leather interior. And the EX does come with heated rear seats, as well. As this is one of our demonstrators, a five year Service Plan is included in the price of the vehicle. Going to the front, it comes with LED daytime running lights, front sensors, LED headlights, Active Cornering lights, as well. And in the centre of the windscreen, you've got your Honda Sensing. Now, they're there for your adaptive cruise control, your other driving aids and safety features. Moving on to the front, Start/Stop technology with keyless entry, multi-function steering wheel with cruise control, automatic wipers, auto headlights. Heads-up display can also be found. You get your 7-inch Honda Connect touchscreen with built-in DAB digital radio. You've got Android car play and Apple CarPlay already installed. This one does come with a 6-speed gearbox. Then, just in here, you've got a load of buttons. Now, they're there for your Lane Keeping Assist systems, turn your sensors on and off, Forward Collision Mitigation Warning, heated wiper blades. Being one of our demonstrators, it is available on low rate finance. And service plans are also available with the service department. If you've got any questions at all, or you'd like to book yourself a test drive, please feel free to get in touch, and as always, we're happy to help.